No one likes exams, but for me, there was a silver lining. 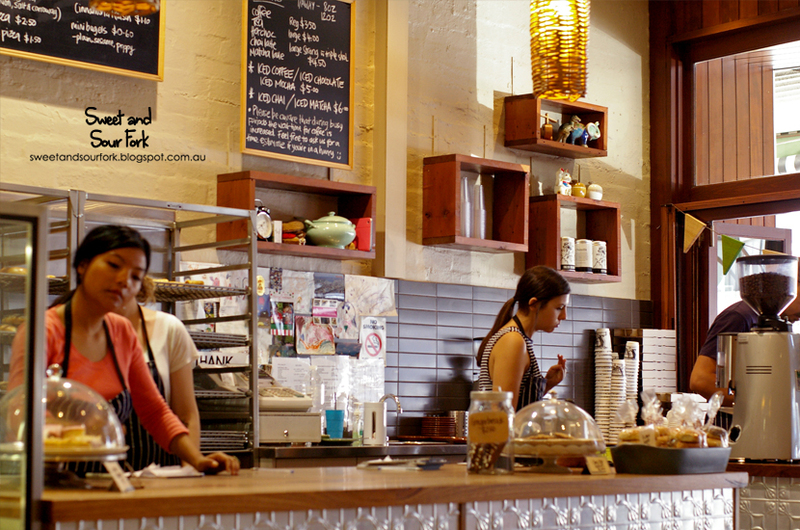 In my uni years, I would take my exams at Caulfield Racecourse, and I would use the excuse of needing extra sustenance to visit the myriad of restaurants in the nearby suburbs of Caulfield and Carnegie. I managed to check out a good few restaurants this way, but before I could try Huff Bagelry, I had completed 4 years worth of exams, and had neither reason nor time to go out to Carnegie on a weekday. These days however, I’m practically rolling around in spare time (please hire me), so I took a sunny afternoon to meet up with Ethan for bagels, coffee, and a good gossip. Having heard of the massive 20 minute waits for take-away bagels at peak hour, we opted to visit around 1:30 instead, and whilst it was still busy, we had no trouble finding a seat. I often scoff at the American culture of endless cups of weak black coffee, preferring infinitely more the pocket rocket brew of Melbourne in thimble-sized cups. 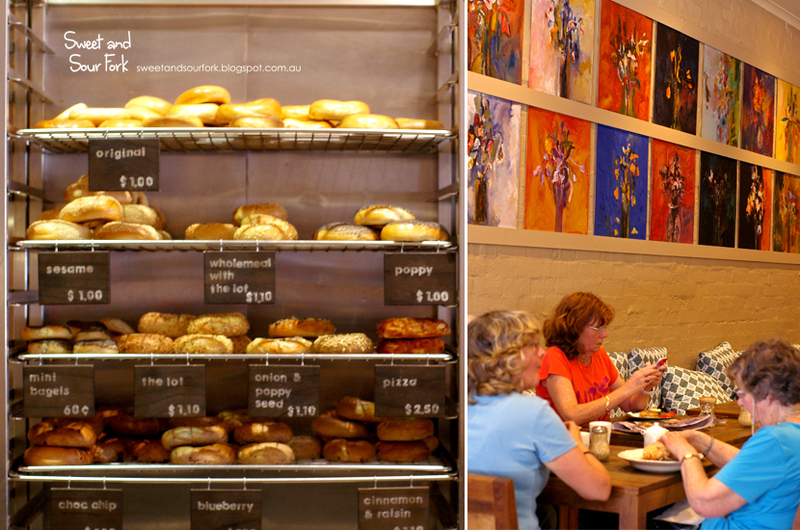 I will admit however that there’s something undeniably comforting about hugging a large, warm beverage, and Huff Bagelry delivered. Ethan’s Latte ($4.5, large) came in a tall ceramic mug, and my Flat White ($3.5, small) was at least the size of a hot chocolate. Though the flavour profile was uninteresting, the coffee itself was tasty and well-made. 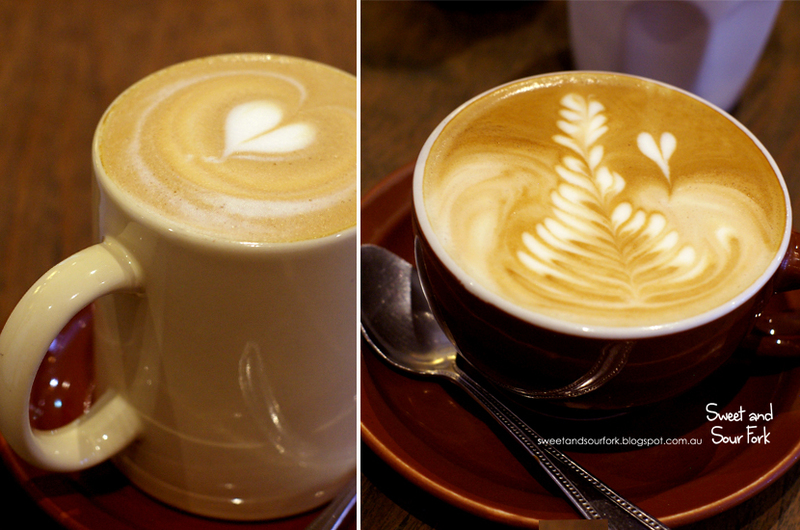 For the first time ever, I wanted to order a second coffee simply to prolong the soothing experience. We ordered 2 bagels to go halfsies on, and God bless Ethan for always ordering the thing I want, but feel too guilty about to get. Ethan chose to get the Chicken Schnitzel ($9.5) on an Onion and Poppy Bagel, and it came out in a rainbow of colours, pretty as a picture. The schnitzel was thick and meaty, moistened by generous dollops of chunky tomoto relish and a melting slice of cheese. 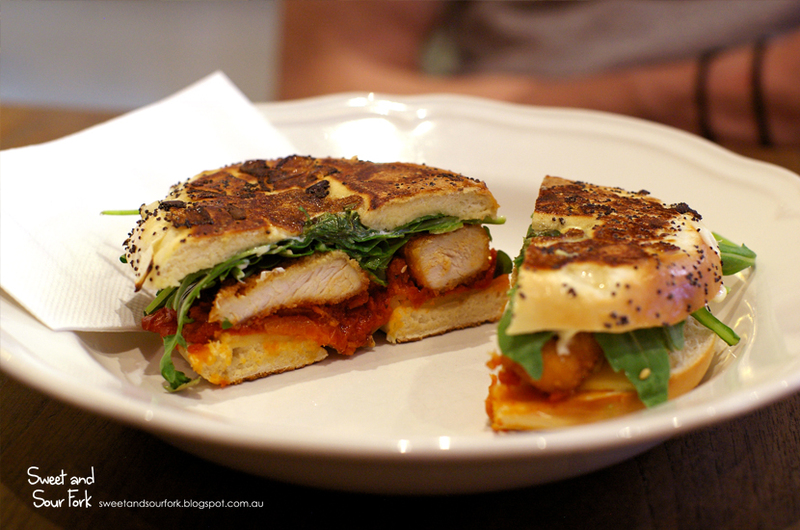 The ubiquitous salad consisted of a fresh handful of arugula, and the onion-studded bagel added a layer of caramelisation to each bite. On the lighter end of the spectrum was my Summer Brekky Bagel ($8.5) on a Wholemeal Bagel with Seeds. Here is where the bagel really shined; lightly toasted so that whilst the outside is crunchy, the middle remained soft and yeasty. 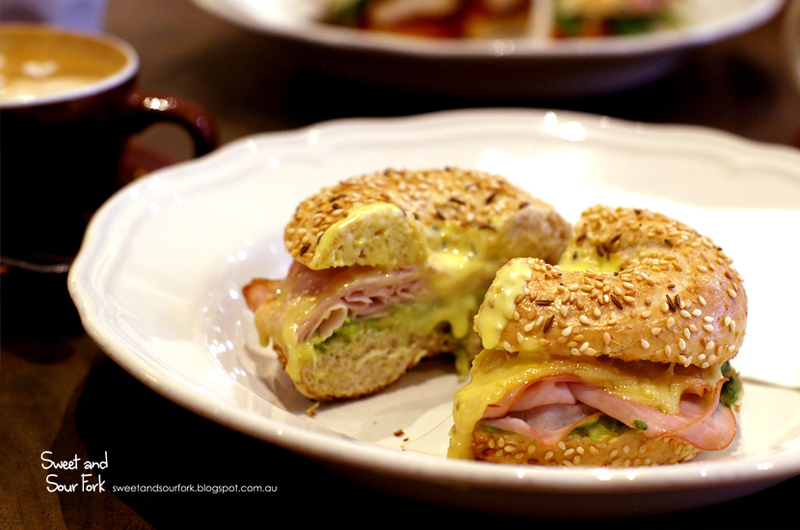 It was a simple and fresh meal, the bagel sandwiching layers of ham, avocado, and oozy hollandaise sauce. It took half a dozen different bagels, but I finally get what the big deal is. 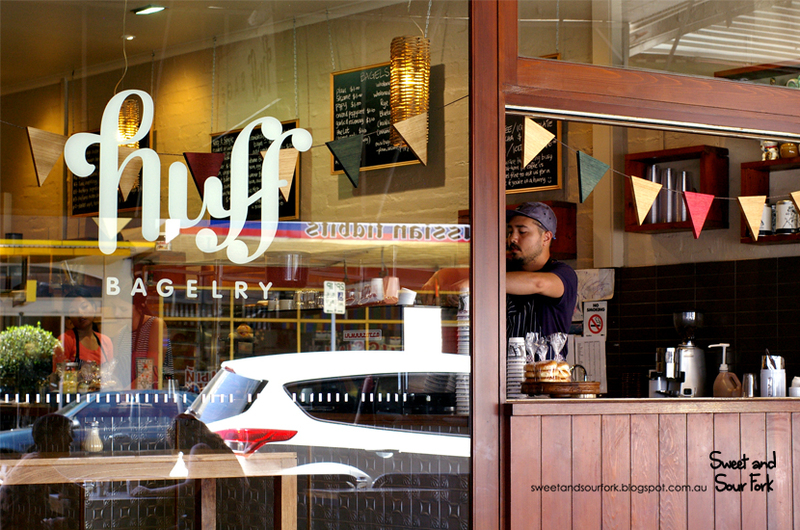 There really isn’t much not to like about Huff Bagelry, with their simple but deliciously fresh variety of bagels and fillings, huge coffees, cosy ambience, and more than reasonable prices. I enjoyed every bite of bagel, and every sip of coffee. Rating: 13.5/20 – blows the house down.